For additional information about this book, visit the website www.conquerdepressiontoday.com. Dr. Valentin Bragin uses his forty-plus years of experience to give readers easy-to-access information about depression and its effects on the body, and how to combat the disorder -- providing proven coping mechanisms and exercises, both mental and physical, and allowing seniors to begin living depression-free lives. When left untreated, depression becomes a deadly disease. It damages the functioning of every organ and shortens lives. But there is hope. Based on science and years of clinical testing, Dr. Valentin Bragin provides a proven program for geriatric patients to recover from depression. 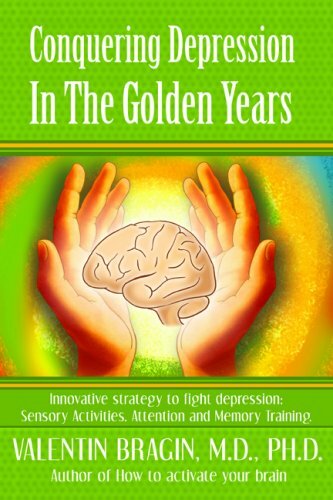 This life-altering book describes what works and explains why it works, in a recovery program that has already helped countless elderly patients suffering from depression. Valentin Bragin, M.D., PH.D., a psychiatrist with over forty years of clinical and research experience, is the founder and medical director of the Stress Relief and Memory Training Center (SRMTC) in Brooklyn, New York. His clinical expertise and interest include stress and stress-related disorders, and brain function rehabilitation in elderly populations.